Today Anne Akiko Meyers, one of the world's premiere concert violinists, releases her latest album, AIR: The Bach Album, with the English Chamber Orchestra; Steven Mercurio, conductor. It's available here and here. 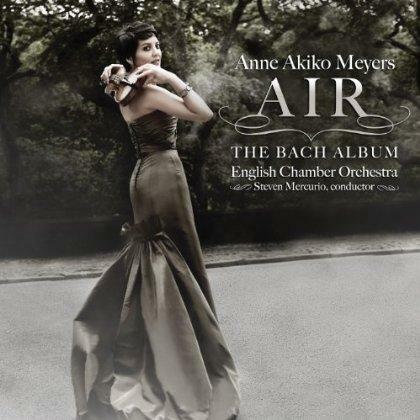 The Air album features Bach's A minor and E major concerti as well as the Concerto for Two Violins in D minor—better known as Bach's Double Concerto. The Double Concerto has been recorded by many duos of great violinists, but on this new recording Meyers performs both solo parts, one on each of her two prized Stradivarius violins. Also on the disc are "Air" from the Orchestral Suite No. 3 in D major, the Bach-Gounod "Ave Maria" and "Largo." Here she talks about making the album. Anne Akiko Meyers was introduced to me by my brother Peter and became one of our favorite musicians. Perhaps she's one of yours, too. If not yet, maybe she will be. Happy Valentine's Day.